If you were around in the 80’s, you probably mixed chia seeds in water and applied them to a terra cotta Chia Pet at some point, and watched as it grew an alfalfa-like carpet of fur. Fun! Fast forward 20+ years and chia seeds have made a resurgence as a superfood, along with amaranth and quinoa, and marketed as an “ancient grain.” Rewind to pre-Columbian times, when chia was likely first established as a major food crop grown in Mexico and Guatemala, and it was widely used to make pinole, a porridge-like meal that was nutritious, filling and traveled well. Because chia seeds contain a high amount of soluble fiber and fatty acids, they expand almost immediately when immersed in liquid, and transform into a gel-like liquid in a short amount of time. This same concept is currently being replicated throughout the US, where chia pudding and porridge are not only convenient and easy meals, but also packed with nutrition and boast other health benefits. I’ve recently begun mixing chia seeds with Vega shakes in the morning, which bulk up during my morning commute to work, and transforms into a perfect tapioca-like breakfast by the time I start my day. 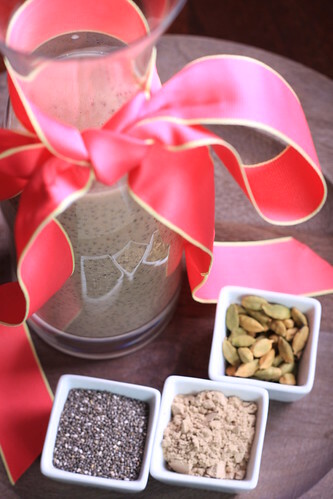 Place all of the ingredients except for the chia seeds in a blender. Blend for a minute, then add in the chia seeds. Pulse a few times, then transfer the mixture to an airtight container. Allow the chia seeds to expand for about 30 minutes. The mixture can be kept in the refrigerator for a few days. Could you substitute coca powder and some form of sugar? Or would there be something else about the Vega powder that would be missing, other than the extra protein? Yes, you can really put whatever flavorings you want in here, it will taste amazing!